Everhard, C. J. (2013). Editorial 4(4). Special issue on accessing and accessorizing for self-access language learning. Studies in Self-Access Learning Journal, 4(4), 227-235. 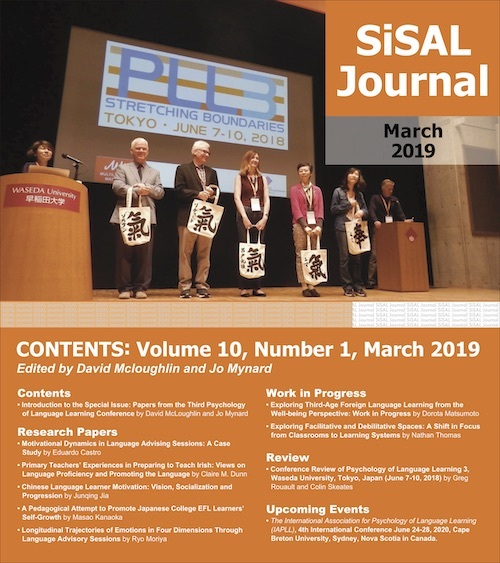 As Guest Editor for this special issue of SiSAL, in which the themes are accessing and accessorising for self-access language learning (SALL), it gives me great pleasure to welcome readers, old and new, whether veterans in the field of SALL, or relative novices. While any journal editor is both facilitated and limited by the range and quality of submissions that are received for a special issue such as this one, my hope from the outset was to be able to bring together a collection in which the various strands and threads of knowledge and experience related to self-access which writers had to offer would weave together to create a web of fabric which would be varied and colourful and aesthetically pleasing and, at the same time, interesting and intellectually satisfying. My desire for an issue which would genuinely add to our knowledge of self-access, which would highlight some key but neglected SALL areas, and which would be suitably globally representative and geographically diverse in relation to SALL activity, may even have been surpassed. In the December 2012 issue of SiSAL Journal, edited by Heath Rose, in my featured article, I suggested that it was time to re-think the meaning of the term self-access and of how it is placed in relation to strategic learning and autonomy in language learning (Everhard, 2012). To this end, I talked about the many misconceptions that exist in relation to self-access language learning and offered a historically-based explanation as to why they have arisen. These misconceptions have to some extent been aided and abetted by the ‘mysteries’ which still surround autonomy and the practices which promote it, although, thankfully, we have the likes of Little (1997; 2013) who continues to further our understanding of autonomy and its relationship with self-access. Although cooperation, interdependence and relatedness are nowadays considered to be the key issues for autonomy, to be able to ‘nurture…its unfolding’ (Noels, 2009, p. 302), like Riley (1997, p. 116) and Little (1997, p. 36), I continue to insist that ‘access to self’ is the essential ingredient in the autonomy – self-access mix (Everhard, 2012, pp. 379-380) and this has been my guiding principle in the selecting and arranging of submissions. I have selected no less than four articles to be featured in this issue. This is not to say that all the submissions were not unique and special in their own way and worthy of prominence, but, rather, these four were spotlighted because they focus on ‘access to self’ in relation to managers, teachers, advisers and learners and the feelings, knowledge, expertise, resourcefulness and resilience which each must draw upon if self-access language learning (SALL) is to succeed, survive and, indeed, be recognised as the science that it is. Recently there has been some debate about self-access and whether, because of technological progress, its end is nigh (Little, 2013; Mynard, 2012; Reinders, 2012). This issue of SiSAL is testament to the fact that ‘self-access’ is alive and kicking and that our aim as teachers, advisers, managers, materials producers and technologists should be not just to ensure the availability of resources to facilitate autonomy and the autonomous learning process, but to ensure that a proper “equilibrium” is maintained between “inner” and “external”, between “human” and “material”, between “cognitive” and “affective” and between “individual” and “social” resources (Allwright, 1990, cited in Everhard, 2012, p. 380). Murray (2009) recognises the difficulties of providing appropriate tools and scaffolding for learners without denying them “opportunities for cognitive growth” (p. 138), while Pang (1994, p. 35) stresses the need to focus on the learners rather than self-access resources as a “physical” entity. All of the featured articles highlight these important points. In the first featured article, in their usual thorough style, David Gardner and Lindsay Miller draw upon a larger research study they have conducted in Hong Kong, to throw some light on self-access management. They begin by considering the qualities that SALL managers have in common with managers in the traditional sense and then by honing in on six of the original eight SALL managers involved in their study, they establish which skills these managers believe either they or their staff members are able to ‘access’ in order to do their jobs effectively. Gardner and Miller manage to elicit for us through these six SALL managers the skills which are deemed to be essential for their operations to run effectively, and how much can be achieved by ‘access to self’ and ‘access to suitably-qualified others’ with regard to SALL management. The researchers emphasise the importance of SALL management as a Community of Practice (Wenger, 1998), since there seem to be no suitable courses which potential or upcoming managers can take in order to prepare themselves, and much of the knowledge required is gained on the job, making the need for apprenticeship opportunities within the Community of Practice of SALL management a clear necessity (Lave & Wenger, 1991). As our second featured article, we are very fortunate to have obtained permission from editor Freda Mishan to reproduce an article by Brian Tomlinson, which will appear in Vol. 16, Issue 1 of Folio, the newsletter of MATSDA, in January 2014. I say ‘fortunate’ because Tomlinson is not in any way restricted by time or place and his ideas emerge from his global experiences as a teacher, teacher-trainer, researcher and materials writer. In this article, Tomlinson, in his own inimitable style, offers an abundance of ideas for activities for teachers and for learners which are, first of all, easily accessible, which are culturally very familiar to learners, are activities which are creative, productive and personally meaningful and involve access to the self and access, engagement and involvement with others. Like Dam (2013), Tomlinson recommends working beyond a coursebook and his suggested activities not only throw light on ways of working towards autonomy, but give a whole new meaning to self-access language learning as it is the learners who create course content through process (Legenhausen, 2013). In the third featured article, Giovanna Tassinari and Maud Ciekanski remind us of the importance of being able to recognise affective factors in language learning and in language advising. Armed with the awareness and the ability to recognise both positive and negative feelings and emotions, which can act either as an affordance or barrier to learning, the teacher or adviser can recognise affective signals as they arise in a dialogue and can learn to react appropriately and advise accordingly. The researchers offer examples and sample speech categorisations from their ongoing research conducted in France and Germany. As with the Gardner & Miller and Tomlinson articles, we are given examples of access to self and access to others and how this can be exploited to good effect in a self-directed learning and SALL situation. The fourth article, by Salomi Papadima-Sophocleous, a relative novice to autonomy and the applications and implications of SALL, is included as a useful documentary of the problems involved not just in creating a modest self-access resource, but establishing it as a start-up enterprise in a newly-founded institution of higher education in Cyprus, where normally it would grow and evolve with the institution in line with the needs and demands of its users. Instead, in this case, the resource becomes ensnared within a maelstrom of economic stringency and cutbacks and as is the fate of many SALL resources which we rarely see reported, becomes labelled as an ‘endangered’ species even before it has had time to justify its existence and prove its worth. As one who has personal experience of organizing SALL resources which depend for their existence on cast-offs, begging, borrowing, volunteering and good-will, I can appreciate and identify with Papadima-Sophocleous’s resolution still to establish a professional and well-thought-through service and her determination not to stint on quality despite all the odds militating against it. While longer-established and more affluent SALL facilities can usually survive the tribulations resulting from sudden re-chanelling or withdrawal of funding and cuts to staffing or their re-assignment to other duties, perhaps it is time for us to listen to accounts of the sometimes heroic efforts of those involved (Reinders, 2012) and to see it as our duty, as linguists, to ensure that such accounts are recorded. In this particular instance, we read of the author’s resolve to provide much-needed scaffolding in the form of learning pathways for a diverse language-learning community, despite the prevailing climate of financial and economic uncertainty. In the four remaining research articles, we also hear of the practicalities of working in self-access mode, first of all with Mark Osborne who uses himself as the subject on whom he conducts research related to using a mobile app to learn Italian vocabulary. This autoethnographic study provides both Osborne and ourselves with interesting revelations, not only from the points-of-view of teacher, learner, materials designer and technologist, but at one and the same time as provider, receiver and analyst of research data. As self-access moves further beyond the ‘walled garden’ to the ‘public park’, described by Reinders (2012), I believe we will see many more such studies. We then move on to a more conventional SALL higher education setting, described for us by Kerstin Dofs, and one which brings with it the perennial problem of how to provide for much-needed speaking activities, and do everything possible to encourage hesitant and inhibited foreign-language learners to produce noise, without this in any way disadvantaging or being to the detriment of other SALL facility users. The published materials which are used for speaking skills practice are identified and analysed in detail and useful information is provided about how a bridge is created between the classroom and the facility, with ‘access to others’, namely teachers, SALL facilitators and peers, helping learners to identify useful ‘external’ resources and learning ‘accessories’ and enabling them to find the necessary ‘equilibrium’ between these ‘external’ factors and their ‘inner’ resources. Students become motivated and make good progress both as learners and as members of the learning community and even find the confidence required to enter the community beyond. Diane Malcolm and Mohamed Majed also provide a useful account of how through skilful facilitation from staff and also from peers, a SALL resource can become meaningful and relevant to its users, who in this case are foundation-level medical students, who are taught through the medium of English. Although troubled by the quandary of whether making self-access compulsory is actually working against the principles of autonomy, paradoxically it seems to have the desired effect, with learners gradually taking on ownership of their learning, of the target language and of the English Development Centre (EDC) and of all the human and material resources placed at their disposal. Awards for taking responsibility for learning and for taking initiatives within the EDC seem to have positive results with students and encourage learners to make full use of the facilities to bring their level of English up to the required standard. Medical students are also featured in the article describing research in progress by Kris Van de Poel, Christine Fourie and Karen Seberechts. The case described is that of South African students who have received their medical education in Spanish-speaking Cuba, and who then have to be able to function as medical practitioners in an environment where the official languages in use are English and Afrikaans, where the whole approach to medical care is different, and where there can be significant differences in the kind of medical equipment in use. While these students have access to on-line electronic medical dictionaries and a vast array of other resources, a more primitive and low-tech tool, in the form of a pocket-size paper multilingual illustrated dictionary, which the students themselves help to build and expand on has been found to work to good effect. Students can constantly add to this resource with words and phrases from other African languages, drawings and illustrations, as the need arises, providing them with a tool which is essential not only to the success of their livelihood and professionalism, but is also essential to the well-being of their patients – a self-access accessory that doctors in their situation cannot afford to be without. The regular column edited by Katherine Thornton, which is unrelated to the special issue themes, is provided by Elizabeth Lammons who gives the latest installment of the evolving story of how the whole team of language advisers at the Self-Access Learning Centre (SALC) at Kanda University of International Studies, Japan were involved in the devising and revamping of their curriculum for SALC Freshmen, with a view to making it more relevant to student needs and therefore more sustainable. The three categories of principles on which the curriculum are based are 1) Format and presentation; 2) Content and sequencing and 3) Assessment. At the core of the curriculum, advisers see an understanding of 1) Socio-affective, 2) Cognitive, 3) Metacognitive and 4) Self-management skills as being essential elements for students. This special issue concludes with a work-in-progress report provided by someone who is something of a rare species in the world of self-access language learning management in that she is a chartered librarian as well as an accomplished language learner. In her report Carolin Schneider describes the ways in which a self-access area within a U.K. academic community aims to offer an all-inclusive service, by providing on-line, electronic, paper, multi-media and human resources, whether peers, teachers, advisers, volunteer assistants or volunteer language experts, all of which and all of whom aim to help the language learners achieve their learning goals. The services are constantly reviewed and upgraded to ensure that the best resources possible are made available and that everyone is kept up-to-date and informed of initiatives within the university and beyond which can help promote knowledge of the target foreign language, its literature and culture. This seems an appropriate juncture at which to bring this editorial to an end and to let the authors and you, the readers, take over and interact. I hope you will find reading these submissions as personally rewarding as I have done. This special issue would not have materialised without the aid and assistance of a very large group of people. My thanks go to Jo Mynard for allowing me to select and pursue the themes for this special issue and for giving me a completely free reign with regard to selection and arrangement of the contributions. She has been a real guiding star and her excellent organizational skills, professionalism and editorial expertise made the process of guest editing altogether smooth and hitch-free. Thanks also go to her and her team for advertising the issue and ensuring that it was widely- and well-publicised. I am extremely indebted to all those who submitted, to the extent that this issue was over-subscribed and regrettably three articles had to be held over for inclusion in future issues. My particular thanks go to David Gardner, Lindsay Miller, Mark Osborne and Diane Malcolm who participated in the blind peer review process and freely gave of their knowledge, expertise and detailed, useful advice. In addition, despite their heavy workloads and professional commitments, Edith Esch, Garold Murray, Richard Cauldwell, Jonathon Marks, Ilse Born-Lechleitner and Ruth Wilkinson also willingly gave of their time and assistance with reviewing when called upon and I thank them all most sincerely. Responsibility for any errors or omissions rests solely with me, the Guest Editor, and I apologise for any mishaps or oversights. Carol Everhard was formerly a Teaching Fellow in the Department of Theoretical and Applied Linguistics, School of English (SOE), Aristotle University of Thessaloniki (AUTh), from where she graduated with a PhD in 2012 on the subject of autonomy in language learning. Although primarily a language teacher, for most of her adult life she has been involved in resources management and first became interested in self-access in 1983, later taking on responsibility for modest self-access centres at the former Direct Teaching Operation of the British Council in Thessaloniki, Greece and then in the School of English, AUTh. For many years she taught an undergraduate course on self-access language learning in the SOE and was also involved in graduate teacher-training courses. She was Coordinator of the IATEFL Learner Autonomy SIG between 2006-2008 and she continues to be a very active member and promoter of the LASIG. Together with Jo Mynard and Richard Smith, she ‘engineered’ the first IATEFL LASIG e-book, published in 2011 and came to be proudly known as ‘The Woman with the Worms’. Allwright, D. (1990). Autonomy in language pedagogy: CRILE Working Paper, 6. Lancaster, UK: University of Lancaster. Dam, L. (2013, September). Developing language learner autonomy with a coursebook – how is it possible? Paper presented at the IATEFL LASIG International Conference, Hannover, Germany. Legenhausen, L. (2013, September). Learner autonomy as a response to the challenges of educational inclusion. Paper presented at the IATEFL LASIG International Conference, Hannover, Germany. Little, D. (1997). Autonomy and self-access in second language learning: Some fundamental issues in theory and practice. In M. Müller-Verweyen, (Ed. ), Neues Lernen – Selbstgesteuert – Autonom (pp. 33-44). Cambridge, UK: Cambridge University Press. Little, D. (2013). Language learner autonomy as agency and discourse: The challenge to learning technologies. Independence, Newsletter of the IATEFL Learner Autonomy Special Interest Group, 59, 13-15. Murray, G. (2009). Self-access language learning: Structure, control, and responsibility. In F. Kjisik, P. Voller, N. Aoki, & Y. Nakata (Eds. ), Mapping the terrain of learner autonomy: Learning environments, learning communities and identities (pp. 118-142). Tampere, Finland: Tampere University Press. Noels, K. A. (2009). The internalisation of language learning into the self and social identity. In Z. Dörnyei & E. Ushioda (Eds. ), Motivation, language identity and the L2 self (pp. 295-313). Bristol, UK: Multilingual Matters. Pang, T. T. T. (1994). A self-directed project: A critical humanistic approach to self-access. In D. Gardner & L. Miller (Eds. ), Directions in self-access language learning (pp. 29-38). Hong Kong: Hong Kong University Press. Riley, P. (1997). The guru and the conjurer: Aspects of counselling for self-access. In P. Benson & P. Voller (Eds. ), Autonomy and independence in language learning (pp. 114-131). London, UK: Longman. Tomlinson, B. (forthcoming). Looking out for English. Folio, 16(1).